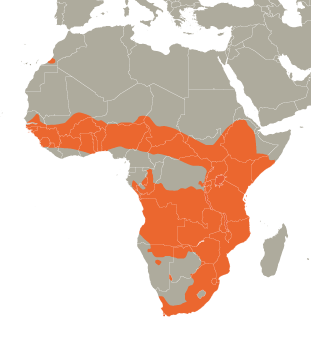 Servals are native to Africa. Their range is in Algeria and south of the Sahara Desert. Servals are known for their long legs, large ears, spotted coats, and short tails. On the back of their large black ears they have distinctive white spots. Servals generally live 10 to 12 years in the wild and can live up to 20 years or more in captivity. Servals are between 23 ¼ and 39 inches long. They are between 9 ½ and 18 inches tall and generally weigh between 20 and 40 pounds. Males are typically larger than females. They have long legs and long necks to see over the grasses in the areas in which they live. Servals have yellowish fur with dark spots; they resemble a small cheetah. They typically have a black-tipped tail. As with all spotted wild cats, servals have distinctive white spots on the backs of their ears which provide them with a way to communicate with their young. When cats are angry or scared they will often pin their ears to their heads. If kittens are following their mother and can no longer see the white spots on the backs of their mother's ears, then they know to hide because there is probably danger. Servals are primarily solitary, nocturnal animals; the exception is a mother with her kittens. Servals are quite feisty when confronted and will often swat with their quick paws, hiss, growl, and even bark. Servals live in the savanna among the tall grasses near a source of water, like a stream, river, or lake. There have been a few melanistic servals seen in mountainous areas and at higher elevations. Servals are threatened by leopards, dogs, and people. Poachers tend to hunt servals and sell their pelts off as cheetah pelts. People also continue to encroach on the servals' habitat. Servals are native to Africa and found primarily south of the Sahara Desert. There is a small population in Tunisia due to reintroduction. Servals primarily eat rodents and small mammals. They are a keystone species and help keep the rodent population at bay. A single serval can eat between 3,000 and 4,000 rodents in a single year. Servals are sometimes killed by farmers who suspect the servals are killing their livestock. 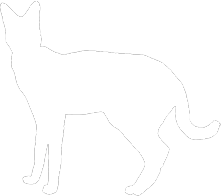 Servals, however, rarely kill livestock and do not often kill animals larger than themselves. A serval’s gestation period is typically around 72 days. Servals can have between one and five kittens in a litter with the average being two. Serval kittens begin to eat solid food around three weeks of age and are independent by the time they reach six to eight months of age. Servals are primarily solitary, with the exception of a mother and her kittens. Servals are nocturnal cats and have been known to travel up to three or four miles in a single night in search of food or to mark their territory. As with most small cats, when presented with a threat the serval will often retreat. However, if servals are confronting one another or a serval is directly threatened by another predator, it will hiss, arch its back to appear bigger, and take quick swipes with its front legs. Servals have the fastest paw strike of any cat at 1/60 of a second, which is faster than a king cobra can strike! 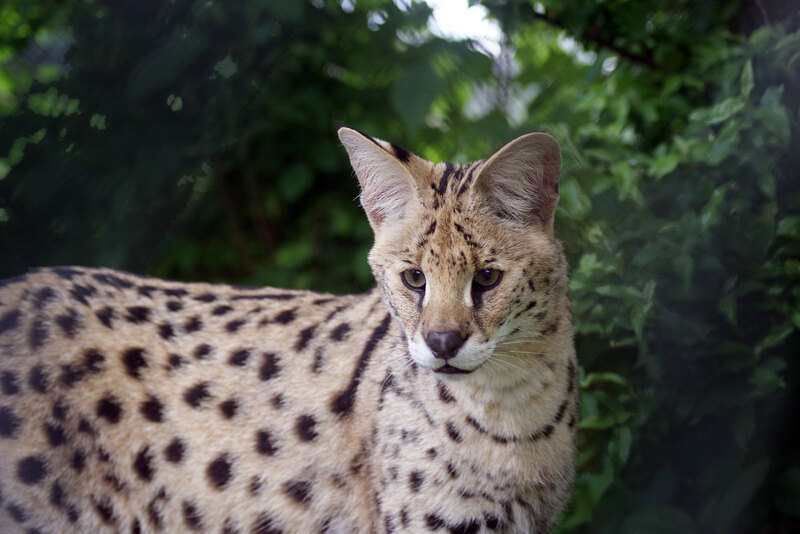 Servals use their large ears and exceptional hearing to locate rodents underground!